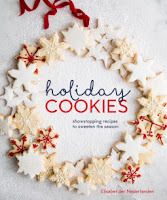 This instant holiday classic is packed with 50 recipes, each gorgeously photographed and meticulously tested, along with dozens of decorating and packaging ideas. Filled with reimagined favorites like Giant Molasses Spice Cookies and Hazelnut Sandwich Cookies; confections like Peppermint Bark, Smoked Almond, and Cacao Nib Brittle, and Dark Chocolate-Hazelnut Fudge; and detailed instructions for gorgeous gingerbread houses, cookie place cards, and edible ornaments, this is a cookie book like no other. Because the recipes are easy to scale up or down, Holiday Cookies is perfect for cookie exchanges, gift-giving, and just enjoying throughout the season. From a veteran baker and recipe developer, each cookie in this collection is guaranteed to be a stand-out and destined to become your new Christmas classic.